The portrayal of Native Americans in popular culture has oscillated between the fascination with the noble savage who lives in harmony with nature, and the stereotype of the uncivilized “bad guys” in the traditional Western genre. The common depiction of Native Americans and the relationship between the white settlers has changed significantly throughout history. In modern times, Native Americans live completely different lives than they once did, yet retain most of their cultural beliefs and traditional practices. In 1851, Charles Dickens wrote a scathingly sarcastic review in his weekly magazine, Household Words, of painter George Catlin‘s show of American Indians when it visited England. In his essay, entitled The Noble Savage, Dickens expressed repugnance for Indians and their way of life, recommending that they ought to be “civilized out of existence”. (Dickens’ essay refers to Dryden’s use of the term, not to Rousseau.) Dickens’ scorn for those unnamed individuals, who, like Catlin, he alleged, misguidedly exalted the so-called “noble savage”, was limitless. In reality, Dickens maintained, Indians were dirty, cruel, and constantly fighting among themselves. Dickens’ satire on Catlin and others like him who might find something to admire in the American Indians or African bushmen is a notable turning point in the history of the use of the phrase. In Leslie Marmon Silko‘s story “untitled; from ceremony” she states how “when they look they see no objects, the world is a dead thing to them”. This explains how the white people viewed land as an object instead of a living breathing thing like the Native Americans did. Because the white people viewed this land as an object, they forced the Natives out of their land so they could industrialize, etc. Thousands of Native Americans lives were lost during this process. Eastern European-produced Westerns were popular in Communist Eastern European countries, and were a particular favorite of Joseph Stalin. 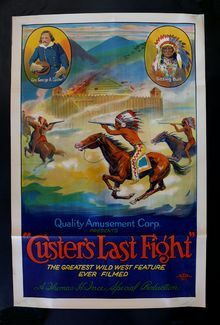 “Red Western” or “Ostern” films usually portrayed the American Indians sympathetically, as oppressed people fighting for their rights, in contrast to American Westerns of the time, which frequently portrayed the Indians as villains. European works frequently featured Romani or Turkic people in the role of the Indians, due to the shortage of authentic Indians in Eastern Europe. The concept of Native Americans living in harmony with nature was taken up in the 1960s by the hippie subculture and played a certain role in the formative phase of the environmentalist movement. The so-called Legend of the Rainbow Warriors, an alleged Hopi prophecy foretelling environmental activism, became popular, with most proponents unaware that the story is fakelore, written as part of an evangelical Christian tract, and an attempt to destroy traditional Native religions. In the US cultural mainstream, negative depiction of Native Americans came to be seen as politically incorrect in the 1980s, as reflected in the production of western films emphasizing the “noble savage” such as Dances with Wolves (1990). Native American characters in comic books and comic strips include Akwas, a comic strip about Native Americans created by Mike Roy, and Super-Chief, an Indian superhero created for DC Comics. In films such as Northwest Passage (1940), Native Americans are the villains, attacking White settlers, often at the instigation of unscrupulous White men. But there are many Hollywood films that offer a more sympathetic picture. Most of the John Ford Westerns show respect toward American Indians, and they are the heroes of such major films as Broken Arrow (1950) and Dances With Wolves (1990). Probably the most famous “Indian” in American popular media is the Lone Ranger‘s sidekick, Tonto, most famously portrayed by Native American actor Jay Silverheels. 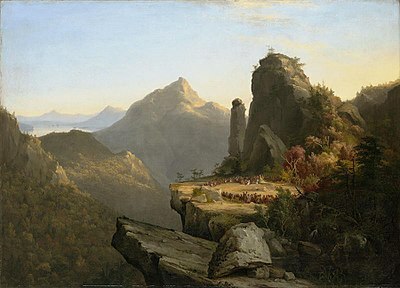 James Fenimore Cooper featured a character called “The Sagamore” in his novel The Last of the Mohicans. Rick, the protagonist of Simon Spurrier‘s novel, The Culled (2006, book 1 of The Afterblight Chronicles), belongs to the Haudenosaunee people and is guided through crises by the sachem. Another character, named Hiawatha, saves Rick’s life and advises him the Tadodaho have said Rick and Hiawatha are aligned. Throughout Sherman Alexie‘s poem, “How to Write the Great American Indian Novel” he states that all of the Indians must have tragic noses, eyes, and arms. Their hands and fingers must be tragic when they reach for tragic food. Natives are portrayed with tragic features because it resembles their tragic history. “The hero must be a half-breed, half white and half Indian, preferably from a horse culture. He should often weep alone. That is mandatory”. Males are depicted as being the strong warriors. Males are also often depicted as wearing headdresses in popular culture. “If the hero is an Indian women, she is beautiful. She must be slender and in love with a white man”. In popular culture women are depicted in a sexualized form. Women are depicted as not portraying strength. However, Native American women are very strong. They picked berries and looked after the kids. An Apache warrior named Nightwolf debuted in the video game Mortal Kombat 3 (1995) and has been a recurring protagonist of the franchise. He is one of the few mortals who are spiritually aware, acting as a historian and shaman of his people. In Red Dead Revolver (2004), the protagonist Red Harlow is half Native American on his mother’s side. In Prey (2006), the protagonist, Tommy, is a mechanic of Cherokee heritage, who is sick of life on the reservation and resents his heritage. In the beginning of the game, after a bar fight, the building is lifted up by a hostile alien ship, and he and his family are abducted. As the game progresses, he must fight to escape. In Red Dead Redemption (2010), disaffected Native Americans form most of a gang led by Dutch Van Der Linde, a major antagonist of the game. A Native American called Nastas aids the protagonist John Marston in stopping the gang because while he shares their resentment for the government’s treatment of natives he does not agree with opposing them in such a radical way. In American Conquest (2003), you can play with various native tribes and empires during the colonisation of the Americas by Europeans. In Assassin’s Creed III (2012), set during the American Revolution, the protagonist is a half English, half Mohawk Native American named Ratonhnhaké:ton. In Infamous: Second Son (2014), the protagonist Delsin Rowe and his brother Reggie are members of a fictional Native American tribe called the Akomish. In Assassin’s Creed: Rogue (2014), an Abenaki Assassin named Kesegowaase is a minor antagonist, the protagonist Shay Cormac also encounters members of the Oneida tribe. ^ Earl Miner, “The Wild Man Through the Looking Glass”, in Edward Dudley and Maximillian E. Novak, editors, The Wild Man Within: An Image in Western Thought from the Renaissance to Romanticism, University of Pittsburgh Press, 1972, p. 106 and Ellingson (2001), p. 8 and passim. In 2009, Peter Gay remarked, “As far as the noble savage is concerned, that phrase is from Dryden and does not appear in Rousseau’s writings. In the years I taught the history of political theory at Columbia to a sizable class of undergraduates, I would offer students a hundred dollars if they could find ‘Noble Savage’ anywhere in Rousseau. I never had to pay up'”, Peter Gay, “Breeding is Fundamental”, Book Forum, April/May 2009. ^ For an account of Dickens’ article see Grace Moore, “Reappraising Dickens’s ‘Noble Savage'”, The Dickensian 98:458 (2002): 236-243. Moore speculates that Dickens, although himself an abolitionist, was motivated by a wish to differentiate himself from what he believed was the feminine sentimentality and bad writing of Harriet Beecher Stowe, with whom he, as a reformist writer, was often associated. ^ Marmon Silko, Leslie. untitled;from ceremony. p. 541. ISBN 0-13-011642-4. ^ a b Tarleton, John (July 1999). “Interview with Michael Niman”. John Tarleton. Retrieved 18 May 2014. This work by a journalist is independent of the source, Niman, and is probably reliable. ^ Melichar, Kenneth E. (2009). “The Filmic Indian And Cultural Tourism: Indian Represent Ations During The Period Of Allotment And Forced Assimilation (1887-1928)” (PDF). University of Georgia (Doctoral Thesis). p. 21 and passim. Retrieved 17 May 2014. ^ See Hiawatha and Longfellow’s The Song of Hiawatha. ^ Spurrier, Simon (2006). The Culled. Abaddon Books. ISBN 9781849970136. ^ alexie, Sherman. how to write the great American Indian novel. p. 425. ISBN 0-13-011642-4. ^ DeLoria, Vine. Indian Humor. p. 39. ISBN 0-13-011642-4. ^ Olp, Susan (29 November 2012). “Crow actor stars in Assassin’s Creed III video game”. Billings Gazette. Retrieved 26 September 2016. ^ Gravning, Jagger (1 May 2014). “Even Superpowers Can’t Separate Seattle From Its Dark Past”. Kotaku. Retrieved 26 September 2016.